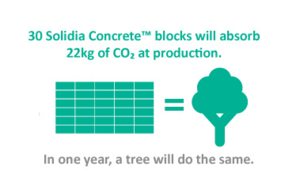 30 Solidia Concrete™ blocks will absorb 22kg of CO2 at production. In one year, a tree will do the same. RIVERSIDE, Calif., Mar. 27 /CSRwire/ - Solidia Technologies® Chief Commercial Officer Bo Boylan joined environmental leaders at a meeting of The California Air Resources Board (CARB) to discuss the impact of Solidia’s ecofriendly cement and concrete systems on California, including a 30% reduction in carbon emissions in the production of cement. Coupled with the capture of another 240 kg of carbon dioxide (CO2) during cement curing, Solidia’s processes can reduce the carbon footprint of cement and concrete in the state by 70%. Additional environmental benefits that would be accrued at California cement plants include a 50% reduction of emissions of nitrogen oxide (5,000 metric tonnes), a 30% reduction in mercury emissions (110 kg), and a 30% reduction in energy consumption (13,000,000 gigajoules). Each ton of cement produces approximately one ton of CO2, making cement production the second largest industrial CO2 polluter, representing 5-7% of the world’s total CO2 emissions. California’s nine cement kilns emit 13.53 metric tonnes of CO2 each year. Easy to adopt anywhere in the world, Solidia’s systems produce a sustainable cement and cure concrete with CO2 instead of water, while utilizing manufacturers’ existing infrastructure, raw materials, formulations, production methods and specifications. Stronger, more durable and higher performing than traditional concrete, Solidia Concrete™ products cost less to produce, reduce water and energy use, and cure in less than 24 hours.